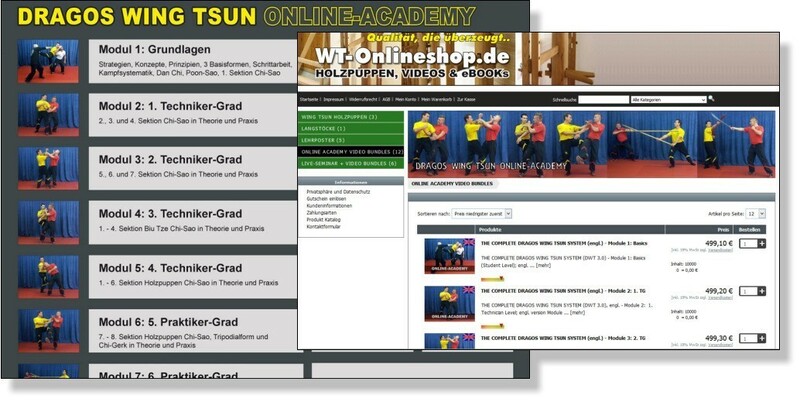 DWT Online Academy contains over 800 videos in German and English, covering the entire system. From the Siu Nim Tao to the Bat Cham Dao double knife techniques, the content is documented in the form of professional filming. This is the result of 3 years of work. DRAGOS WING TSUN went through a long developmental process in which the early years were dedicated to compensating for the so-called "Missing Links" of traditional Wing Chun. It is precisely the secret cult of the Chinese, and those who carry it along, that led to a vacuum of knowledge and impoverishment of the martial art over the generations. Dai-Sifu Martin Dragos spent most of his life looking for the "lost knowledge" and developed his own solutions to previously unresolved scenarios. It's like dealing like a "spoiled soup" - it will be impossible to reach the desired taste. You will have to start cooking all over again. This is the reason why a functional system must be based, from the beginning, on a consistent and coordinated approach. The latest DWT development stage is known internally as 3.0 and includes the whole system, with the armed and unarmed contents. First and foremost, the video directory serves the intensive training participants (WT Masters Academy), as documentation of the knowledge acquired, for further preparation and reinforcement of the content of the program at home. Recent developments can be watched and compared at any time (Updates). DRAGOS WING TSUN PARTNERS (Tutors) have obtained this tool as a necessary directory to guide them in the process of transmiting the teaching content. With this methodology, it is possible to achieve a high degree of standardization. For people who are unable to participate in the face-to-face seminars, due to distance or other circumstances, the Online Academy provides access to information, which makes progress possible, in an autodidact manner. The following samples contain excerpts from DWT Online Academy and will give you a taste of what you will find in our face-to-face seminars. You can access the content by clicking HERE or in the image below! If you're in a hurry - Go slowly! The purpose of the Online Academy is not to nurture the market of countless charlatans from the WT industry, whose intention is just to accumulate knowledge quickly and then, a few days later, to proclaim themselves a "Grandmaster" of their own style on the internet. Every week, we are approached by the so-called "advanced practitioners", who know the whole WingTsun system, "except the weapons", among other things. Morally, we are facing a dilemma. On the one hand, we want to make our martial art available to a wider audience. On the other hand, there are people who have bad intentions and are prone to charlatanism. Our recommendation is that you are first familiar with the fundamentals of the system and then the programs in sequence to effectively evaluate and deepen your content. In order to find the middle ground, I decided not to run a pure video content system, but to link the access to the Online Academy with the live seminars. The corresponding live seminar (one intensive week or several weekend seminars) has already been included in the purchase price for a respective program module. This is intended to motivate the buyer to the perception of the importance of live-training and to move those, which only want to become "overnight Grandmasters" to give up. Our goal is to address those real WingTsun enthusiasts who are interested in getting a solid education. Insights and samples are provided to him with sufficient material for a real assessment of what is offered. Nobody buys the cat in the sack. The buyer can take part in intensive weeks (4 days each) within one year or in four individual seminars in order to learn his or her specific program level. With the aid of the video clips of the Online Academy, he/she can see all the contents and prepare for the live seminars at home. We understand that a TG, who has been fooled and had his development intentionally delayed for decades, can hardly wait to finally complete the whole system. The recommendation to start from the beginning again, therefore, appears to them as a step backwards. However, from my many years of experience I know that TG's learn much faster than beginners. So, if you decide to join in, you will start with a lot of content (content which, by the way, you probably don't know yet! ), but you will absorb these contents in a very fast time window. For someone who has been kept in the dark for 20 years of his or her life, a period of a few years to really achieve the goal of learning the whole system should be a small price to pay. Since there are no waiting times in DRAGOS WING TSUN LEAGUE, your progress is limited only by your own hard work and talent. You can either purchase a module for a discounted price directly at a seminar with the Chief Instructor Dai-Sifu Martin Dragos or as part of a training course with one of our DWT partners (Tutors). Each participant always starts with the basics training, even if he/she was an advanced (TG, PG) in his/her previous association. The bases of DWT have little to do with the bases of Classical WT, and skipping this level would lead to failure in the progression down the road. We therefore ask for your understanding. After payment confirmation, you will get the access link to the video gallery in where you can view videos online(stream) and download as well.